William Ruble's parents, Thomas and Elizabeth, migrated to Indiana about 1834. Thomas was born (1797) in Washington County, Pennsylvania, near where the Campbells would soon teach and preach. William and Ruth married there and he operated a lumber mill and grist mill. Moving to Arkansas, he built mills and sold them and them moved to Missouri where he again built and sold mills. 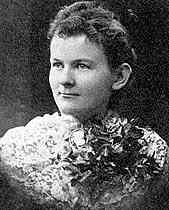 More information about the pre-Oregon days of the Ruble family is online. The creative William Ruble became disenchanted with society and seized the opportunity to move to Oregon. 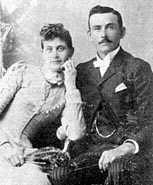 His younger brother David married Ruth's sister Orlena and the two families traveled together over the Oregon Trail in 1853. This marriage would also qualify David for 640 acres of Oregon rather than the 320 available for single men. William was among the few travelers that could provide a horse-drawn carriage for his wife. Normally the ladies walked the 2,000 miles at about 15 miles per day. Both families took up Donation Land Claims about four miles west of Salem in the Eola Hills. David eventually moved to Alsea and built the first saw mill and grist mill in that area. The church still remains in Alsea. He then moved on to the coast were he established the town of Waldport in Lincoln County in 1879. He and Orlena are buried near Waldport. William and Ruth took up farming and the nursery business. He even built a ferry boat so the public could reach Salem on a free ferry. This was in 1856. During this period of his life, he taught himself Hebrew and Greek, becoming proficient in both languages. He translated portions of Scripture that were later published. As he was leaving from Missouri, the congregation saw that he was ordained so he could preach in Oregon. However, public speaking was not his special calling in life and he did as little as possible. His effectiveness was as a writer. 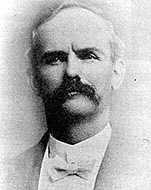 Their son William Newton (Bill) was naturally gifted at public speaking and became the family preacher after William, Bill and Bill's brother Schuyler moved to Golden, Oregon. Their purpose there was gold mining and they were very successful at this work. This move was about 1878 and Golden is about four miles east of Wolf Creek. They soon met as a church and later built a building that still stands. See the Josephine County, Golden, entry for photos of the building after it was built and as it is presently seen. Artists still use the building as a subject. One such painting hangs near the door of the Kellenberger Library on the campus of Northwest Christian College in Eugene, Oregon. The reader may wish to read our entry on Josephine County, Oregon. 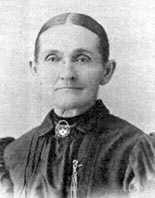 While Bill Ruble taught the adults on the Lord's Day and Schuyler Ruble and his wife Abigail Smith Ruble made sure the children had their proper teaching on the Lord's Day, their attractive sister Columbia taught the children on week days. She was the first school teacher in Golden, holding classes in a log cabin in the days before the first school house was built. There was an effort to set up a community that was free of the "worldliness" as possible. Drinks were not sold and there is no record of dancing in Golden. There were community get-togethers with food and fun. The glory days of Golden were not to last. Bill Ruble moved his family to Ashland in 1901 so they would have access to better education. They eventually moved to Eugene. William and Ruth returned to their Eola farm. Schuyler passed away in 1908 at Salem. David came overland in the same party as his older brother William. They were married to sisters. Settling first at Eola, west of Salem, they moved on to Alsea in Benton County where David built a grist mill and saw mill. After a flood there, he moved on the coast and established Waldport. He donated land for a church building, making it the first Church of Christ or Christian Church on the Oregon Coast. He and Orlena had nine children. Their choice of names broke with the ordinary: Marion, Victoria, Arizona, Orange Judd, Marshall, Eldorado, Arsina, Mary Lavina and Martha. The Rubles have, as a rule, been religious people to whom we can look back with pride. We never knew of a Ruble being intoxicated or of begging his daily bread, although but few have aspired to much wealth. 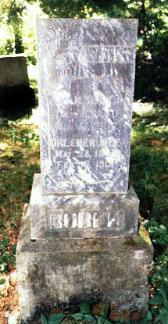 Both David Ruble and his wife Orlena are buried in the Alder Grove Cemetery, off Eckman Creek Road east of Waldport. It should be noted that the death certificate of David Ruble reports his death as November 18, 1907 and that of Orlena Ruble as February 24, 1912. Photo of the headstone is by Joanna Long of Vancouver, Washington.